What he has made, or rather incubated, are wasps. They fly from his mouth “like wicked words — the soldier’s confession — made manifest. They rise away and whisper to the moon.” Ockert’s opening chapter manages to be both lyric and menacing. Gent physically disappears from the novel, but he has brought a nightmare to New York state. Nolan Baxter, divorced from his wife, lives on the Muller family vineyard in the Finger Lakes. Nolan’s son Hudson comes to stay for the summer, and his younger step-brother, Speck, comes along. Hudson is there to work, while Speck “could use the fresh country air.” World War II veteran Gus Muller, now widowed, lives with his daughter and granddaughter, Madison. Gus straddles the line between quirky and strange, crossing into the latter when he pinches his wife’s ashes into a glass of Pinot. Hudson climbs into a faded yellow harvesting truck and sits behind the wheel. He lets the smell of oil, gasoline, baked-in sweat, and the faint waft of cigarette smoke seep in. The cushion has been slashed and stuffing spills around the pedals. Plastic on the dashboard is peeling off. The glove box handle is hot to the touch. Hudson uses the tips of his fingers to open it. Inside are a half-dozen charred Barbie dolls that have melted into one grotesque body. All of the hair has been singed, and the faces are smooth and expressionless. Wasp Box reads like a sequence of graveyards; the portrait of a place and family that is headed toward trouble. On one journey through the forest, Speck drifts off with the Mullen family dogs. He finds a nest of wasps, the entire tree “infested and thrumming.” The wasps descend and blanket the dogs, who flee. Speck has been stung, but seems to be spared the worst. The dogs are not so fortunate. This attack, coupled with the novel’s ominous opening, made me think Wasp Box would become apocalyptic, the latest novel in a successful litany of recent airbone toxic events. Ockert’s focus is a bit more narrow. The wasps thrash, but they are boxed in, bound to the slow science of spreading. This allows Ockert to tell a taut but evolving story with many threads. Hudson’s subplots are the most interesting, including his attraction to Madison, his uneasy relationship with his father, and his fear of Crowley, his co-worker for the summer who is increasingly unstable. Hudson’s narration is so charged and profluent that Nolan becomes a bit lost in the novel. It is almost as if Hudson has already become his own man. while the brief, terrorizing five minutes of distraction on the train causes baffled travelers to shake their heads in wonder, and several victims are treated by the on-board nurse for the minor stings on their arms, this incident will not be merely anecdotal — you’re not going to believe what happened on the train ride — because one of the workers made good. All the stinging and bussing is a distraction. To fell the giant simply takes a single, Q-tip-sized queen that, during the melee, dropped down onto a shirt collar. Ockert calmly describes the coming moments of the queen wasp’s “soft, unassuming, anesthetic bites,” which will deposit an egg sac in a woman’s ear canal. This is controlled, not detached, prose. There have been several fine novels in recent years that sketch the coming apocalypse, whether arriving by land or by air. 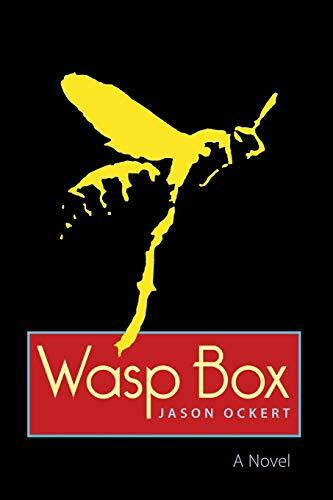 The wasps make their mark in Wasp Box, but Ockert has some surprises in store for the reader in the novel’s final acts. At 179 tight pages, Wasp Box is an argument for the short novel in the vein of The Burning House by Paul Lisicky and A Good Day to Die by Jim Harrison. There’s not an ounce of bloat in this book. Ockert’s masterful usage of first person contributes to the story’s immediacy. Ockert suggests that the wasps’ agitation merely elevate the swarm that resides within all of us. By exercising control over his prose and his content — by making the focus of the book how Hudson’s search for independence pushes against his father’s desire to strengthen their relationship — Ockert manages to tall a narrow tale that pulses wide. Wasp Box is a measured documentation of destruction. In one scene representative of the novel’s tone, “Nolan has no way of knowing that three days ago a curious red fox was attacked by a small platoon of wasps that had advanced from the railroad,” nor did he know that the fox died beneath ripening grapes, or that one of the Mullen dogs had been rolling in the fox’s remains when itself was attacked. Ockert reveals how sometimes evil arrives not with a bang or a whimper, but with the calming buzz of the inevitable. When first I learned about Leanne Shapton’s Swimming Studies, I anticipated delicately written and visual riffs on swimming, a topic dear to me. I didn’t realize that Shapton, best known for her art direction and illustrations for The New York Times, was a serious competitive swimmer as a teenager growing up in the Canadian city of Mississauga. What Swimming Studies reveals is how those experiences have guided her, have in fact infiltrated her adult life on a molecular level it seems. Like Shapton, I too was a competitive swimmer. Unlike her, I’ve never won an officiated competitive race and my times certainly never qualified me for Olympic trials, like hers did. I came to swimming as a kid who loved the water. By default of not being very good at any other sports I ended up on the swim team in middle school and then discovered water polo, drawn to the sport’s splashing full-body-contact. I joined the water polo team in high school and for a few summers played in a league. Because most water polo players were swimmers, during the winter season I too became a swimmer. Five days a week, I’d churn through thousands of yards of water, from time to time I’d do two-a-day practices; I would weight train, carbo-load, and even shave my legs before the big meets. My senior year I was one of the team’s captains, but only because some of my teammates felt bad that I hadn’t been selected to captain the water polo team. It didn’t matter — I had fun. Some of these guys counted among my closest friends, and the team’s coach changed my life (another story for another time). There were a few guys on the team who were on Olympic trajectories, or at least that’s what coaches and parents told them in order to justify their grueling year-round schedules and regimens. I was always happy to cheer them on or be a lap counter for their long-distance races, but that was as close as I got to being a champion swimmer. Swimmers like me had weekends and would go months at a time without structured practices. My body is not big and lanky and I do not have feet that resemble flippers. No amount of training would have gotten me to the Olympic trials. Physical attributes aside, I never had the drive to be a serious swimmer because I discovered other interests, like the girls’ team and The Grateful Dead. So I simply swam for fun and in doing so built up a familiarity and comfort level with the water that I’ll never lose. I basked in the easy paychecks of lifeguarding at summer camps and country clubs, sometimes earning extra teaching little kids how to do flip turns. To this day, any swim I take, whether doing laps at the Y or floating in whatever body of water I can access, is a pleasure, and a respite from the gravity of life on land. Doubtless, if we raced, Shapton would beat me, but we both possess, and thrive off, “a knowledge of watery space, being able to sense exactly where [our] body is and what it’s affecting, an animal empathy for contact with an element.” And here we start getting at the heart of the matter and what makes this book astounding. Any dedicated swimmer knows exactly what Shapton means; we sense and control our movements, from the tips of our fingers to the flutter of our feet, breathing very specifically, detecting any shifts in conditions, from the presence of other swimmers to the tug of a current. For those intimidated by the water, such intimacy with it is horrifying, or at least serious enough that you never go out beyond where the waves break. But Shapton pares down her experiences as a swimmer and grafts the core lessons to other parts of her life, allowing them to bloom in ways that have everything and nothing to do with swimming. I put the batter-filled mug in the microwave and set the time to 1:11:00, the time I want to swim the SC 100m breaststroke in 1987. Then I cover my eyes with one hand, finger on the start panel, imagining my starting block and the pool…I push Start on the microwave. Breath, dive. In the kitchen, in my track pants, there are eight or nine strokes the first length, a two-handed touch, and silence again at the turn…Halfway down the pool on my final length I hear sharp beeping and open my eyes – the microwave is flashing 00:00:00. Too slow by about five seconds. Living in northern California after college, I always got a kick out of never really being able to swim in the frigid Pacific waters, even during summer, but during the winter always being able to find an open outdoor pool. It was in these years when I met the woman I would marry. Here again Shapton and I share something else in common: a bond with our spouse forged by water. In the case of my wife, I taught her to be more at ease in the water by teaching stroke mechanics and the importance of exhaling when your face is submerged. And while she still refuses to join me out in the big swells off a beach like Waimea Bay on Oahu’s North Shore, I turned her on to swimming as exercise and the joys of long relaxing paddles through the tranquil waters of lakes in central Maine. James, Shapton’s husband, imparted to her something even more important than taking a shine to water: “Watching him in the waves, I realize he doesn’t see life as rigor and deprivation. To him it’s something to enjoy, where the focus is not on how to win, but how to flourish.” As Shapton comes to terms with her life as being more than just a swimmer, her flourishing is the ability to share herself with James, her family, friends, and herself in a way that had not been possible when she was more a swimmer chasing a record than an individual. Exploring memories of meets and practices, while also talking to her family and friends today, and paying close attention to swimmers of all sorts, Shapton is able to identify competitive swimming’s influence on her out of the water. We learn that next to her bed she keeps a framed black-and-white photograph of a woman swimming. In Shapton’s mind, the swimmer is oblivious to the photographer: “It reminds me of the love I have for James when he doesn’t know I’m looking at him.” Reading of Shapton’s process of accepting her new relationship with pools, she unpacks several such insights and perspectives, referring not only to her relationships with people but with her approach to art. The coral blue cover stamped with a dark blue swimming cap makes clear that Swimming Studies is indeed meant to be a physical object, a piece of art. The book features some of Shapton’s watercolors. Their subtleness is strikingly appropriate. The same as a flailing splashing crawl stroke does not result in swimming fast, no matter how quickly you move your arms, Shapton knows how to make both her written and visual ideas glide, concealing the hard work necessary to create the perception of effortlessness. All that matters is the end result. Though in this case, the artwork is secondary because Swimming Studies is not about Leanne Shapton the artist, it is about Leanne Shapton the person, and while swimming, visual arts, and other people are all vital components in her existence, she has learned how to define them, rather than let them define her: swimming not as a way of life but life as a way of swimming. Knausgaard doesn’t write here to understand, but to associate—to get close to truths larger than himself. How often do you feel like airborne toxic events are completely irrelevant, along with humanism and the attendant concerns? This book sounds good, but it also makes me want to stumble around. How many other books are good? I get exhausted. It is tempting to read Juba’s explanation as an ars poetica of sorts for Scott, who goes to great lengths to establish the anomaly that is the fictional city in which his stories are set. Cross River exists at that intersection of reality and alternative history. It was founded by the survivors of the only successful (and yet curiously obscure) slave revolt in American history, led by a man known only as Ol’ Cigar. It remains predominantly black to this day, divided into the bougie Northside and the more impoverished Southside, the latter of which is subject to routine and extreme flooding whenever the rains fall heavy. The city is home to the historically black Freedman’s University, as well as three notorious crime families (the Jacksons, Johnsons, and Washingtons). It boasts its own local sound, called Riverbeat, as well as its own local demonyms (either “Cross Riverian” or “Riverbaby,” depending on who you ask). It sits in close proximity to Port Yooga, Virginia, but also to the Wildlands, a swathe of undeveloped wilderness populated by madmen, wolf hunters, and escaped zoo animals. That all might sound like worldbuilding worthy of Karen Russell, but Scott’s fiction is mostly absent of fabulism and whimsy. A few of the stories operate as satire — “Party Animal” describes the reverse evolution of a young man from the debate team to a state of forest-dwelling ferality, and the very brief “Klan” involves a surreal psychology experiment on the campus of Freedman’s — but most of the book exists firmly within the realm of naturalist fiction. In “202 Checkmates,” a young girl learns to play chess from her unemployed father, who patiently instructs her in the application of the game’s lessons to real life, even as he celebrates every victory with pentecostal zeal: “He jumped and shuffled across the floor like the Holy Ghost had slithered up his pant leg.” The girl’s losses quickly reach triple digits, but she nevertheless manages to figure out those life lessons, even some that her father has yet to realize. Another story, “Confirmation,” follows thirteen-year-old Bobby in the weeks leading up to the sacrament which will (as he understands it) usher him into adulthood. He isn’t devout so much as curious, with questions regarding Jesus’s whiteness (“Damn negroes want to make everybody black,” opines his mother) and the true sinfulness of his masturbatory habits. His pastor and parents are unwilling to offer him many answers, though that doesn’t save him from having to make a Christ-like sacrifice for the sake of his sober father. These stories, told from the viewpoint of children, are among the strongest in an uneven collection. The pieces that deal more directly with the mythology of Cross River generally do so to their own structural detriment. Stories like “Everyone Lives in a Flood Zone” and “Razor Bumps” are derailed by their interest in esoteric local lore or power structures. In the latter, an amusing piece about a barber who has lost his ability to cut hair is subsumed by a subplot about a rapper, who relates to the rest of the story only in that he’s currently being blamed for the death of a police officer that the barber once knew. The text of the story features recurring excerpts from an interview with that rapper which, while echoing some of Juba’s ideas about Cross River’s exceptionalism, do nothing to elucidate the central mystery of the story. By the time a conclusion is reached, the plot has moved so far away from its principle tension that it elicits no emotion from the reader. Similarly, the final story, “Three Insurrections,” forces a rather opaque Cross River-centric framing device over what is otherwise a story about a Trinidadian immigrant’s experience with the King assassination riots in Washington, D.C. Its Cross River material — which involves a mysterious book, a prophecy, and some unlikely family migration patterns — is the story’s weakest aspect, distracting from an otherwise compelling rumination on racial resentment and political violence. Scott is an impressive ventriloquist, adopting a number of disparate narrative voices over the course of the book. He offers many brilliant lines (“I’ve never been one to watch weather reports. It’s more honorable to take the weather as it comes”), and writes about race, fatherhood, lust, and envy with estimable candor. Perhaps he is stuck, like nearly every artist, between what he knows how to do and what he hasn’t yet mastered. He knows how to write a small, realistic, domestic story. Neither chess nor the sacrament of confirmation are terribly fresh metaphors in 2016, but he can work them into narratives that satisfy. And yet his prose feels most alive when he’s pursuing those images and plot twists tied to the minutia of his created world, even if their thematic importance to the story at hand remains cloudy. What does it mean to rewrite the Bible in slang? And how does that redress the sting of police profiling? An answer is there, perhaps, though it has yet to find its fullest articulation. The world of Cross River feels larger than one book, and Scott may intend for Insurrections to be the first volume in a long investigation of that city. For now, the collection feels like a miscellany of early works grafted imperfectly onto a rigid frame. (Which is fine. Many debut collections are made this way.) Scott’s imaginative capacity is prodigious, and his fictional world feels vast and riotous with potential, but Insurrections is ultimately less successful, perhaps, than the rebellion from which it takes its name.